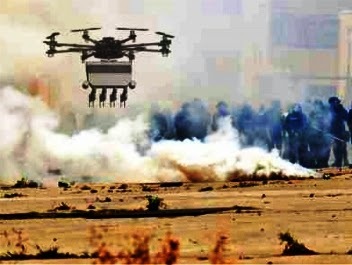 In a recent development that's sure not to be reciprocated against with escalating force, South African drone manufacturer Desert Wolf has created a new crowd-control contraption that can shoot protesters with dye, plastic projectiles, or even a beautifully-bouquet'd barrage of pepper-spray-filled paintballs. TheVerge.com reports that the Skunk, as the drone is known, has four cameras and four separate ammunition hoppers with which to mete out face-searing force. Controlled by a two-man operating team of a pilot and a "payload operator" (gunner), the Skunk will make its debut patrolling the volatile environment of South African mines. If the Skunk's glaring lights and amplified command orders don't work, the operators may simply rain peppery hellfire down on their charges. Desert Wolf director Hennie Kieser claims the operators will be watched by microphone and camera to "ensure they aren't too aggressive." Because nothing says "peacekeeping" like pepper paintballs. The Skunk, stinking things up. Image courtest uavactual.blogspot.com.